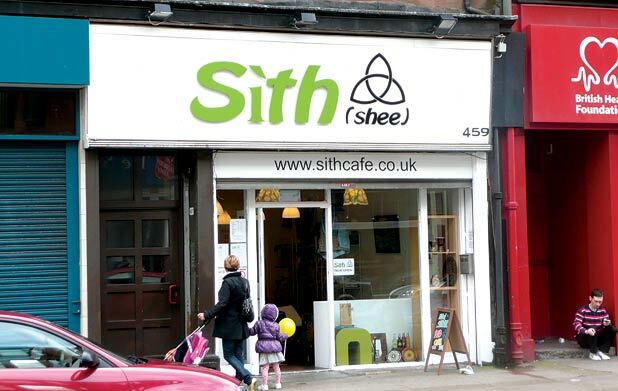 Sith (pronounced ‘shee’ – Gaelic for ‘peace’) is a new cafe at 459 Dumbarton Road just around the corner from Partick Underground station in Glasgow. Run by two women with strong connections in the Gaelic and Gay/LGBT communtities, it incorporates a café, art and crafts gallery, shop selling fair trade clothing and a simple alternative hang-out space. The food is simple but thoughtful with baked sweet potatoes, tapas, wraps, panini and dinner specials. Coffee is organic fairtrade and there’s wi-fi, board games and various music, knitting, and Gaelic conversation sessions through the week. www.sithcafe.co.uk, 0141 334 9013. Callum Morrison, owner of Relish deli in Leith, has opened up Rocksalt café at 46 Constitution Street in the old William Nimmo printer’s shop. With more space for tables and a kitchen, he’s been able to develop a full menu with all-day breakfasts, nice salads and a daily stew. There’s a good cross-over with Relish, which will sell food prepared at Rocksalt, while the good local food available at the deli has a place on the café menu and in a couple of small deli fridges. It’s open from 8am daily, 9am at the weekends, 0131 554 9873.